The most expensive cars in the world are so much more than just a mean of transportation. These rolling art pieces do encapsulate the priorities of the one percent, in the universe , the flamboyance and swagger take precedence over the practicality and also efficiency. These are truly mind-boggling machines. The dream car brings with it the thrill superior Engines which achieve mind boggling speeds and you can sit up with the spine chilling instant braking. 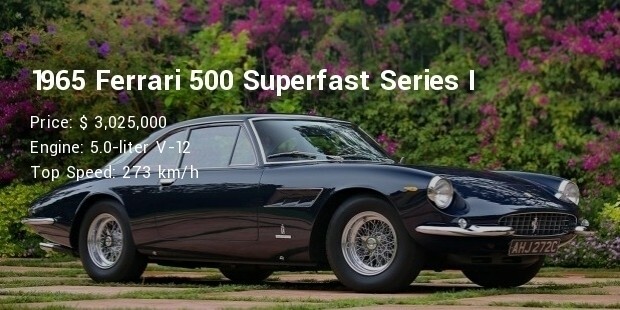 One of 32 built from a batch of one of history’s favorite Ferraris, this car has a (small-time) racing history and is mechanically all original, down to its 320-hp 3.3-liter V-12 and five-speed manual. It was introduced at Paris in November, 1963, the LM was successful for privately entering racers around the world. A fully independent double wishbone suspension was specified with rack and pinion steering and four wheel disc brakes. 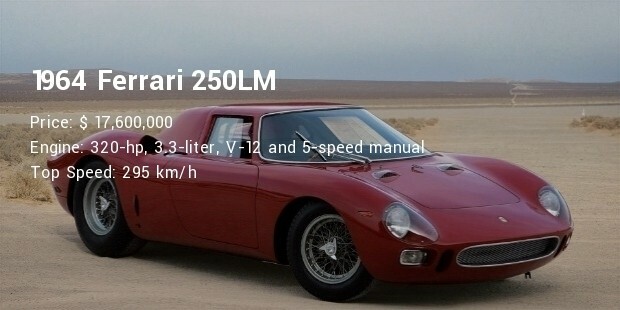 The 250 LM thus had to run as a Prototype until it was homologated as a Group 4 Sports Car for the 1966 season. The North American Racing Team Ferrari 250 LM that won the 1965 24 Hours of Le Mans is a popular attraction at classic car shows and was on display recently at the 2013 Amelia Island Concours d’ Elegance. 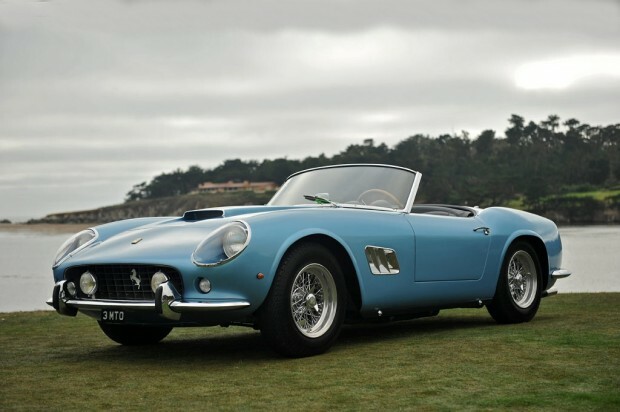 In 1960 Scaglietti revealed the 250 GT California Spyder SWB at Geneva, its body pulled more tautly over this updated chassis. 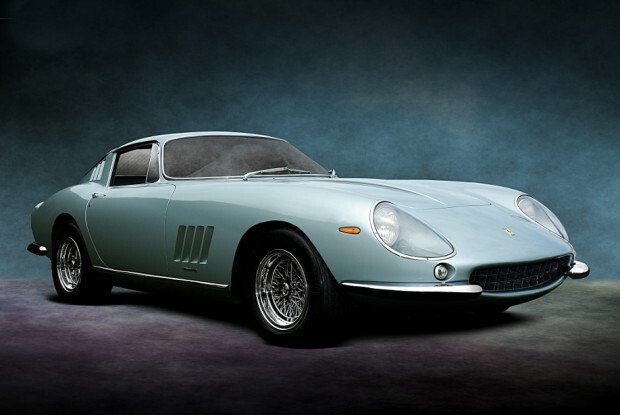 The fact that this car was originally painted metallic blue and had a red leather interior—a charming change of pace in the red-over-tan sea of Ferrari-dom—doesn’t seem to have hurt its value, although Gooding’s description of the car more or less encourages the next owner to return it to its original colors. 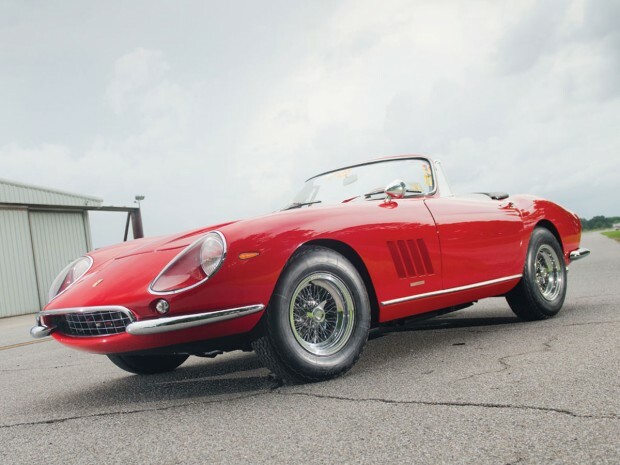 Naturally, it was painted resale red by a car dealer in New York in the late 1960s, pretty much as soon as it was brought over to the States and traded in on a new Jaguar E-type. 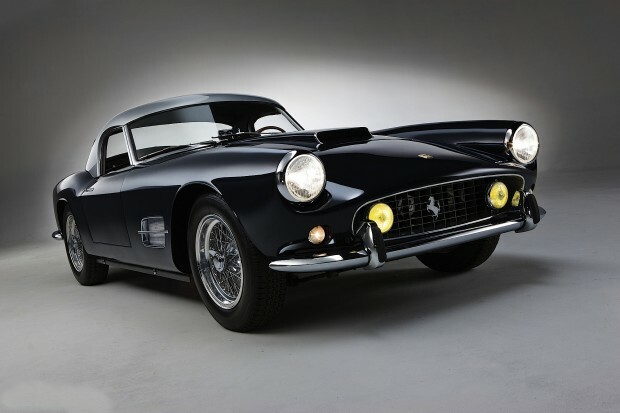 In any case, California Spiders are among the most desirable cars on the planet, and ­­this example’s closed headlights and short wheelbase add to the appeal. Nuccio Bertone, head of Carrozzeria Bertone, was this car’s first owner; he co-designed it with a young Giorgetto Giugiaro. This sultry one-off was shown at Geneva and Turin when new and was featured at the Pebble Beach Concours d’Élégance in 1982, 1997, and 2003. This experimental creation by the great Torinese coachbuilder was actually quite remarkable for the completely new style which it proposed. Born in a wind tunnel, this harmonious design resembled the profile of an airplane wing. 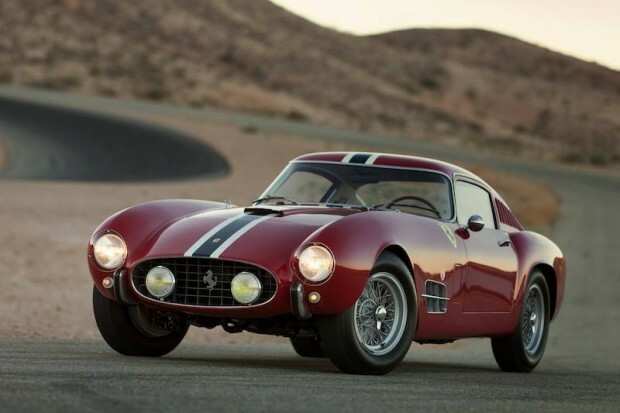 The leading edge was, in fact, the nose of the car, in the middle of which was the air intake for the radiator, an ellipse of very reduced dimensions resembling that of several sports Ferraris. The trailing edge was represented by the rear deck, streamlined to a point, upon which converged the curves of the roof. The graceful curve of the hood, devoid of all harshness, was particularly remarkable, as was the shape of the windshield, whose posts, very noticeably curved inward, reinforced the effect.... This marvelous two-place Coupe can certainly be considered as one of the most significant examples of the art of coach building..."
The car features numerous proprietary designs and technologies; it is lighter and has a more streamlined structure than many modern sports cars, despite having one seat more than most similar sports cars, with the driver's seat located in the centre (and slightly forward) of two passengers' seating positions, providing driver visibility superior to that of a conventional seating layout. It features a powerful engine and is somewhat track oriented, but not to the degree that it compromises everyday usability and comfort. It was conceived as an exercise in creating what its designers hoped would be considered the ultimate road car. Despite not having been designed as a track machine, a modified race car edition of the vehicle won several races. 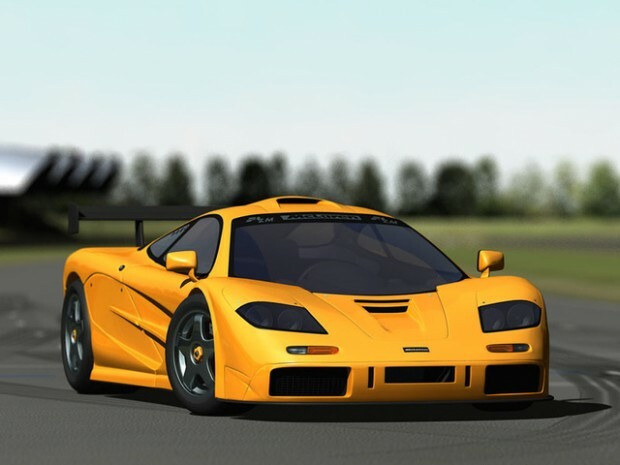 Only 106 cars were manufactured, 64 standard street versions (F1), five prototypes (XP), five tuned versions (LM), one LM prototype (XP LM), three longtail roadcars (GT), one GT prototype, and 28 racecars (GTR). Production began in 1992 and ended in 1998. 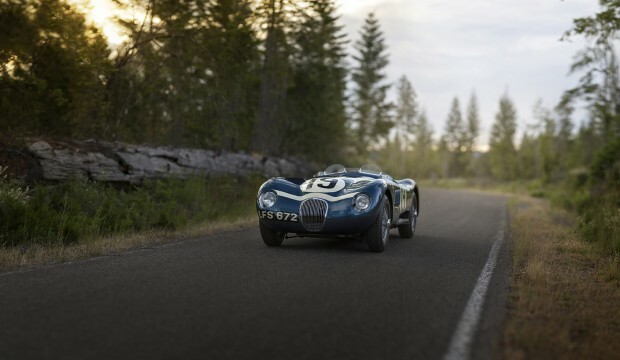 Jaguar C-type lightweight roadster is four-speed fully synchronized manual transmission, independent front suspension with upper and lower wishbones, torsion bars, and hydraulic dampers, live rear axle with trailing arms, ‘double-action’ torsion bar, and torque reaction member with hydraulic dampers, and four-wheel hydraulic disc brakes. 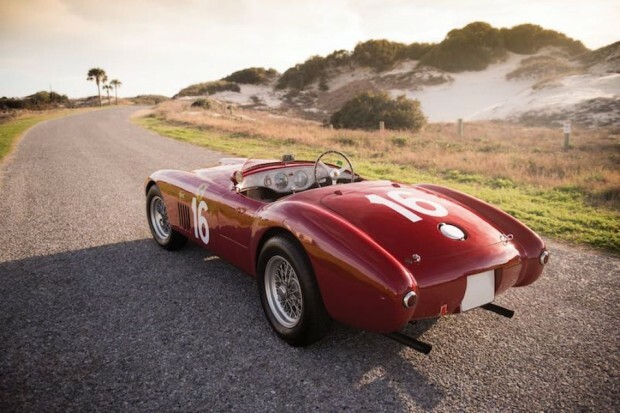 It was first owned by Marquis Alfonso , who piloted the car to victories in the grueling Tour de France Auto in 1956. It is worth mentioning that this was not just a few laps on a closed course, but a multi-day event consisting of 3,600 miles of all-out racing, including six circuit races, two hill climbs, and a drag race. 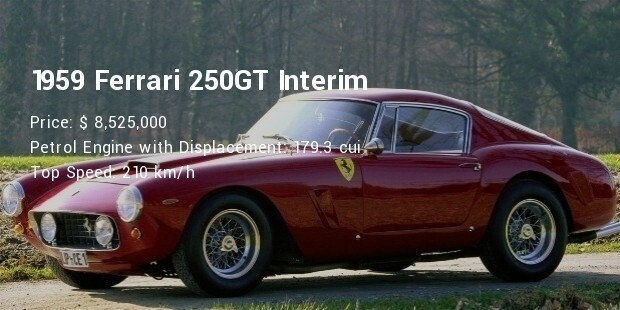 The fact that the 250 GT LWB Berlinetta came out on top of such a gruelling event spoke not only to the performance of the car but also to the level of craftsmanship behind it.This is the first of the famous TdF Ferraris, and it has earned best-in-class awards at various concours. 263 bhp, 2,953 cc SOHC V-12 engine with three Weber 40 DCL3 carburettors, four-speed all-synchromesh manual transmission, independent front suspension with unequal-length A-arms and coil springs, live rear axle with semi-elliptical leaf springs and parallel trailing arms, and four-wheel drum brakes. The engine is the same as the one used in the Porsche 936/81, the Type-935 2.65 L turbocharged Flat-6, producing approximately 635 hp (474 kW) (originally developed as an Indycar engine; hence the cubic capacity used). The very first dual clutch gearbox was also designed for the 956, mated to a traditional 5-speed manual.Successfully using a unique aerodynamic principle known as ground effects to create large amounts of downforce, the 956 model changed the landscape of prototype sports cars. The 956 was developed for the new Group C regulations by engineer Norbert Singer and developed by Porsche in-house at their motorsport facility in Weissach. 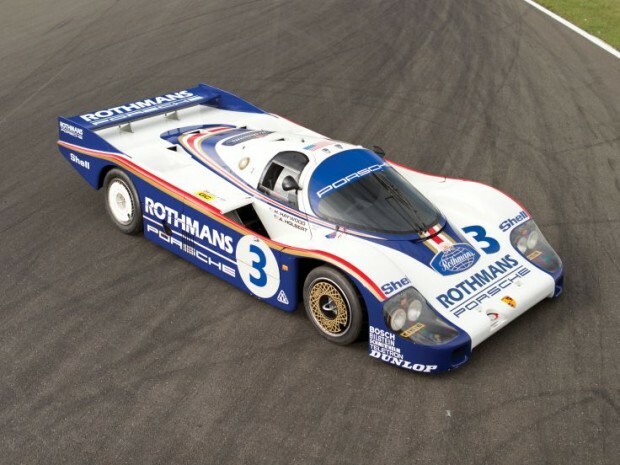 The 956 features a chassis made of an aluminium monocoque, a first for the company, helping to allow the car to meet the 800 kg (1,764 lb) weight minimum in Group C.As a Porsche works racer, this marvel took overall victories at Le Mans, Spa, Fuji, Brands Hatch, and Kyalami in the hands of drivers Jacky Ickx, Jochen Mass, Derek Bell, Al Holbert, Hurley Haywood, and Vern Schuppan. 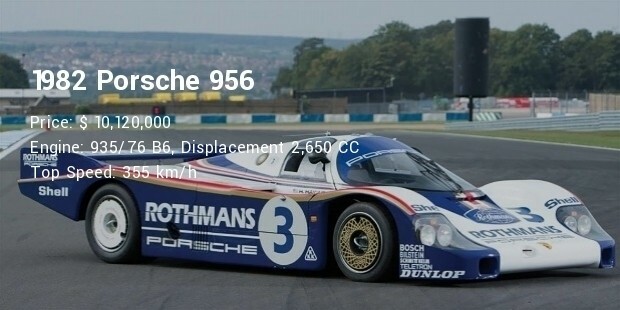 One of only ten working 956s, this Porsche is among the most historic endurance racing cars and the single most successful Porsche 956. 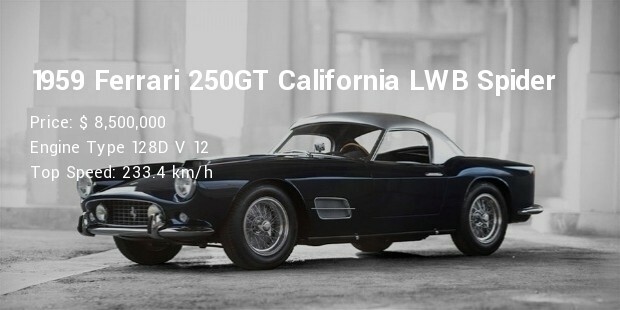 Ferrari 250GTs are some of the more desirable cars in history. It was a successful racing car for privateers Plus it looks striking as all hell. 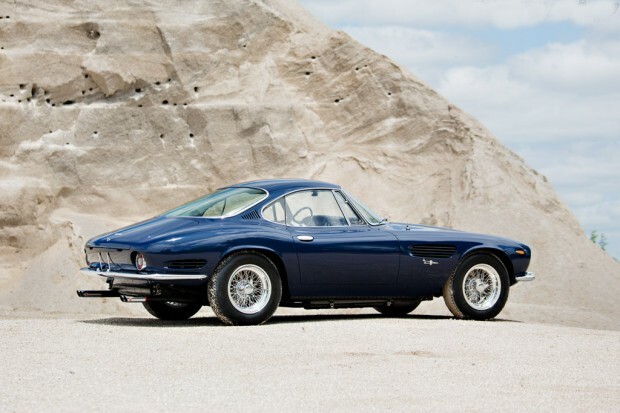 in 1959, seven 250 GT Berlinetta "Interim" LWB coupés were made. 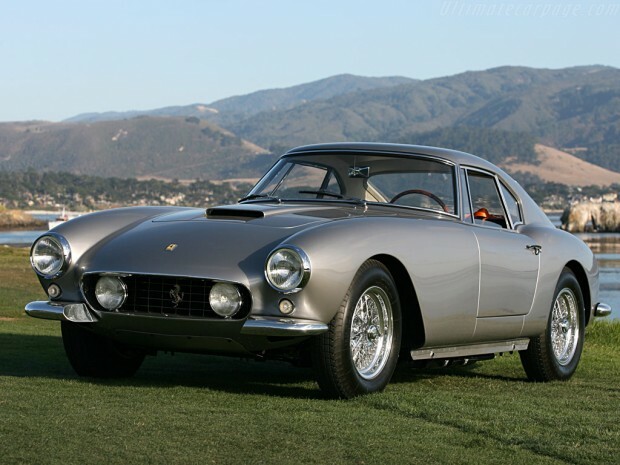 They utilized the old long-wheelbase chassis and had the new Pinin Farina bodywork of the upcoming SWB Berlinettas. The bodies are all-aluminum. Interim vehicles have an additional rear quarter window, absent from the succeeding "Passo Corto" Berlinettas. 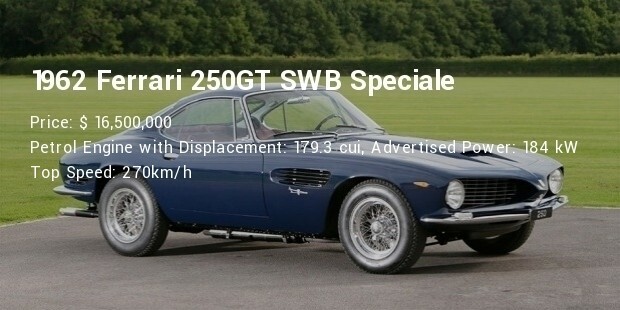 A Bolognese prince bought this car new but soon sold it to Wolfgang Seidel, a German racing driver . It retains all of its important original components, and features uncommon Superamerica-style fender vents and velocity stacks. 240 bhp, 2,953 cc SOHC Colombo V-12 with triple weber carburetors, 4 - speed manual transmission, independent front suspension via A-arms, coil springs, and telescopic shocks, rear suspension via live axle, semi-elliptical springs, and hydraulic shocks, and four-wheel hydraulic disc brakes. Wheelbase: 102.4 in. The car’s special features were not only skin deep. Under the hood, the car’s 3.0-liter Colombo engine was topped with triple Weber carburetors, which breathed through factory-fitted velocity stacks contained within a cold air box; these are highly desirable performance options that were fitted to only a handful of examples. Inside, the ignition switch and other controls were relocated from the dashboard to on the transmission tunnel below the dashboard and instrument panel, allegedly in an effort to give taller drivers more leg and knee room. 220 bhp, 4,101 cc longitudinal 60-degree Lampredi V-12 engine with triple Weber Tipo 40 DCF3 carburetors, five-speed manual transmission, independent front suspension with unequal-length wishbones, a transverse leaf spring, and hydraulic shock absorbers, rear suspension with a live rear axle, semi-elliptical springs, hydraulic shock absorbers, and an anti-roll bar, and four-wheel drum brakes. Wheelbase: 95.27 in. Turn on the fuel pumps, turn the key for ignition, press the starter, and the 4.1-liter Lampredi V-12 instantly fires to life. Throttle response is immediate, and the power and torque available from the engine is infectious. At full tilt, the engine produces the most glorious noise, one that any enthusiast would never tire of, even while winding through 1,000 miles of Italy’s best roads. 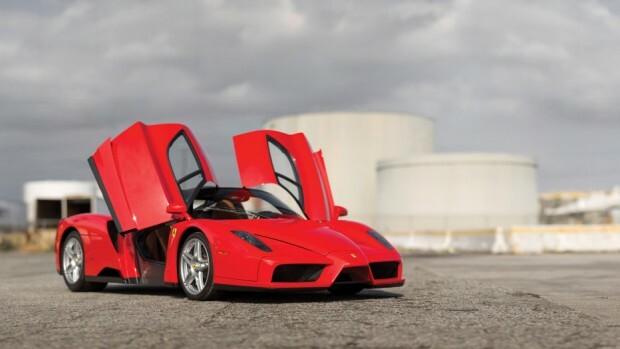 The final Enzo produced, this car was originally given to Pope John Paul II. His Holiness respectfully declined the gift and asked that it be sold for charity. He died a few months later, but the proceeds were given to his successor, Pope Benedict XVI. 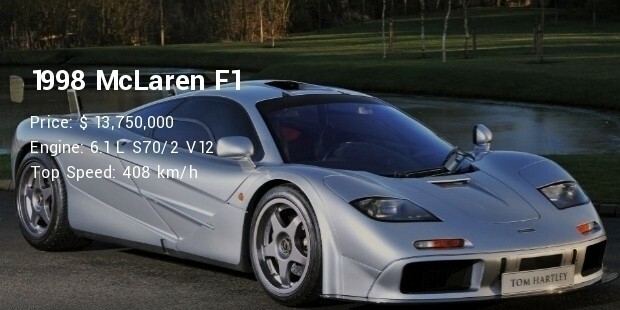 660 bhp, 5,998 cc DOHC 65-degree V-12 engine with Bosch Motronic engine management and electronic fuel injection, six-speed electro-hydraulic computer-controlled sequential F1 transmission, limited-slip differential and traction control, front and rear pushrod-actuated double wishbones with horizontal external reservoir coil-spring damper units, and four-wheel ventilated carbon-ceramic disc brakes. Wheelbase: 104 in. Its rear spoiler was crafted of bare carbon fiber, which is a one-off feature that presents a wonderful contrast of color. The cockpit features an upper dashboard and steering wheel in Nero leather, as well as seats and lower dashboard in Cuoio leather. 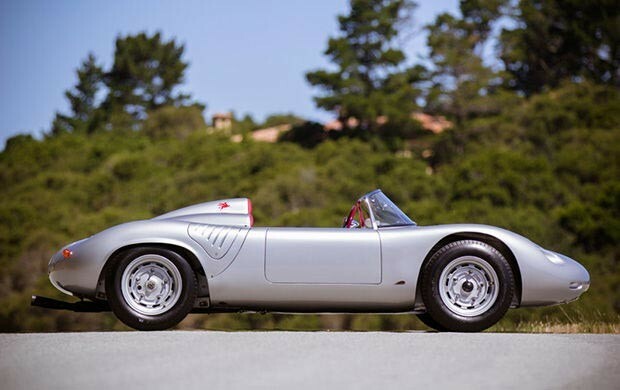 This Spyder’s first job was as a works racing car, and it was piloted by the likes of Jo Bonnier, Dan Gurney, Hans Herrmann, Graham Hill, Bob Holbert, and Stirling Moss at tracks such as Le Mans, Sebring, the Nürburgring, Nassau, and Mosport. 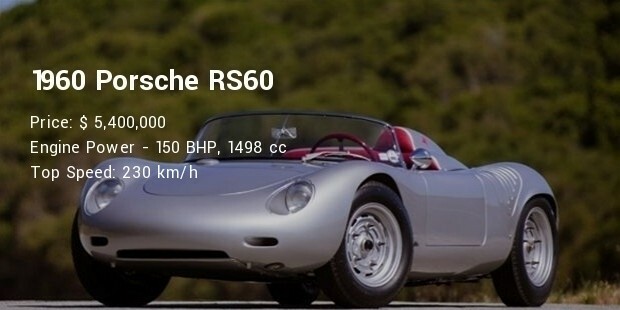 Built in response to changing FIA regulations dictating frame width and windshield height, the RS-60 was on evolution of the '718 Series' RSK, itself a successful sports/racing car utilizing Porsche's fabled small bore 4 cam motor. The year 1960 witnessed Porsche losing the world manufacturer's championship by the slimmest of margins with the RS-60 defeating the mighty Ferrari's and Maserati's at Sebring and the Targo Florio. Throughout its racing career, 718-060 was never crashed and today retains all of its original components including body, engine and transaxle. Clearly Shah Reza Pahlavi of Iran had very good taste, because he was the first owner of this gorgeous Grigio Metallizzato over red coupe. 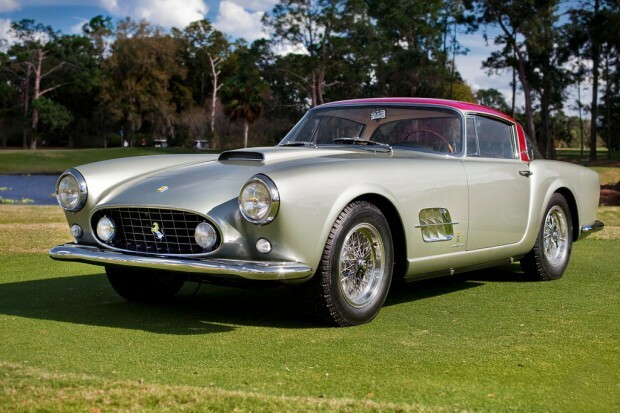 According to Gooding, he and his wife, Princess Soraya, “developed a love for Ferraris” when they “were exiled to Italy in 1954.” Soon after, they collected the car from Enzo Ferrari himself. 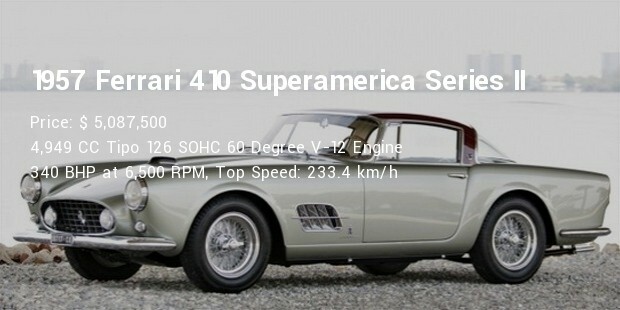 The Ferrari 410 Superamerica was a continuation of the Lampredi-powered 375 America. 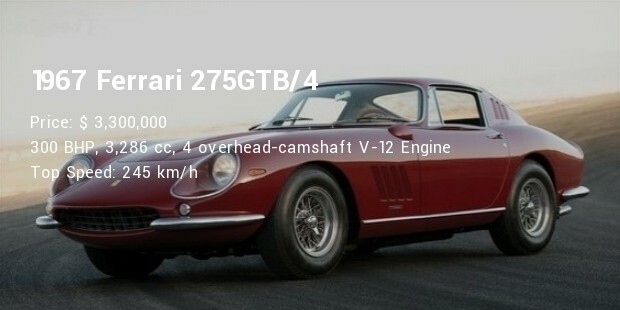 The engine was enlarged to 4963cc resulting in 340 horsepower. 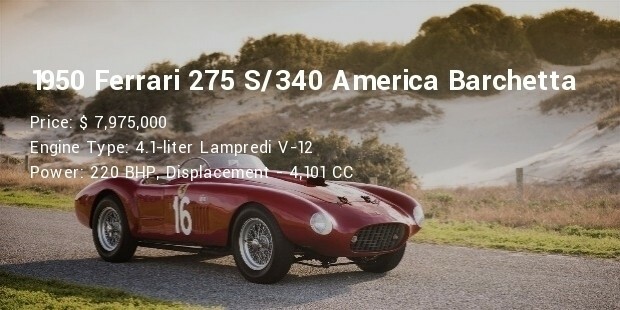 The 375 America displaced 4,522cc and produced 300 horsepower. Modifications continued throughout the vehicle, including an increase in track width by 130 mm at both the front ad rear. The transverse leaf springs in the front were replaced with coil springs. These changes gave it a wider stance with a more modern appearance and better stability at speed. 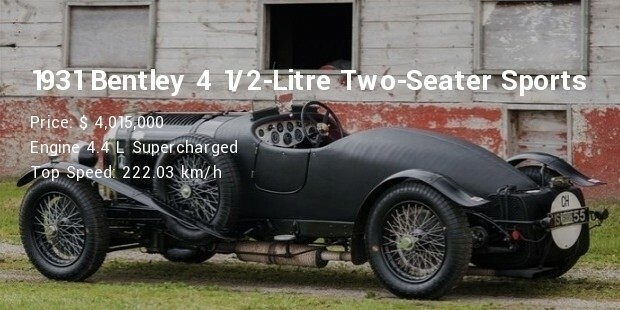 Only 50 “Blower Bentleys” were built, and this one still has its original chassis, engine, supercharger, and gearbox. Although the Bentley 4½ Litre was heavy, weighing 1,625 kg (3,583 lb), and spacious, with a length of 4,380 mm (172 in) and a wheelbase of 3,302 mm (130.0 in), it remained well-balanced and steered nimbly.The manual transmission, however, required skill, as its four gears were unsynchronized. The Bentley's tanks - radiator, oil and petrol - had quick release filler caps that opened with one stroke of a lever. This saved time during pit stops. 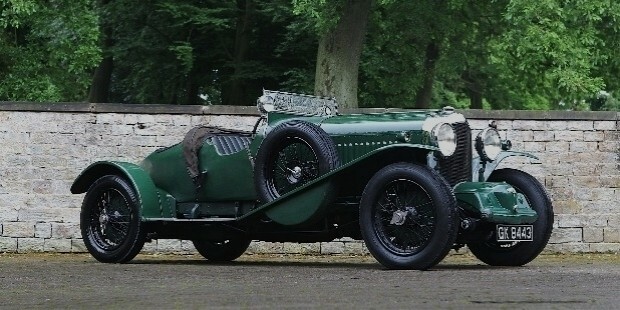 The Blower is the most iconic pre-war Bentley and is coveted by collectors despite never winning a single race. 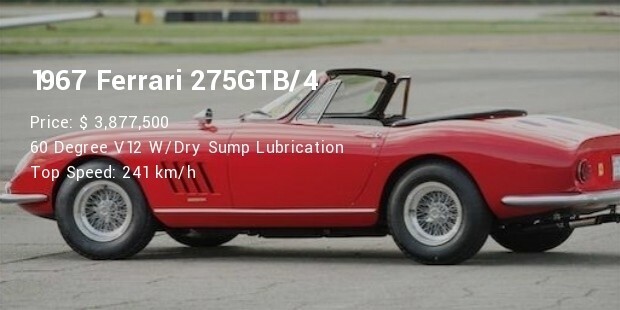 This voluptuous Ferrari has many desirable features, including “long-nose” aluminum bodywork, a torque tube, and six Weber carburetors, which feed a 3.3-liter V-12. A California car from new, it retains its original paperwork, tools, and jack. 305 bhp, 3,286 cc V-12 engine with six Weber dual-choke carburetors, five-speed manual transaxle, four-wheel independent suspension with upper and lower wishbones, coil springs, and tubular shocks, and four-wheel disc brakes. 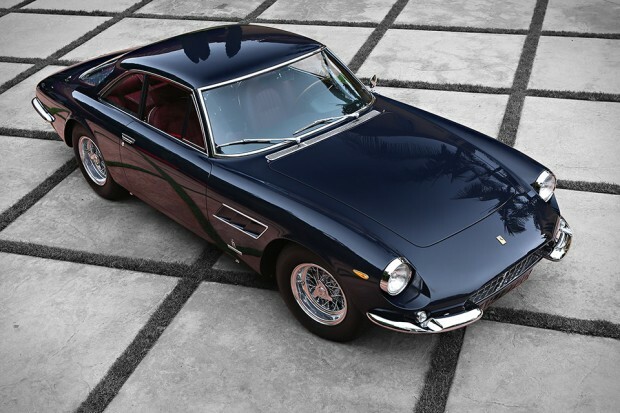 Considered by many to be one of the most spectacular Ferraris ever built, both in terms of design and mechanical prowess, the 275 GTB is a brilliant automobile in every respect. The long-nose, torque-tube examples are understandably sought after, and the very few examples of those outfitted with six carburetors and aluminum coachwork. 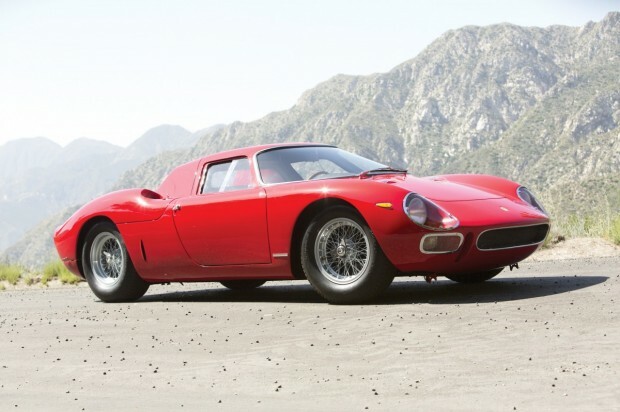 Famed Ferrari dealer Luigi Chinetti took a Lamborghini Miura and a Maserati Ghibli on trade-in from this car’s original owner. 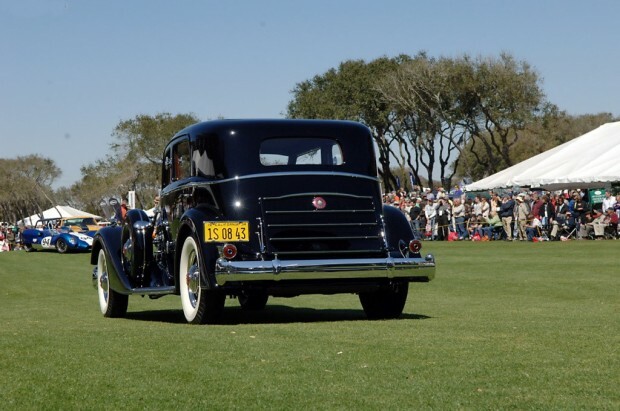 This unrestored coupe took second-in-class at Pebble Beach in 2013 in the Postwar Preservation class. 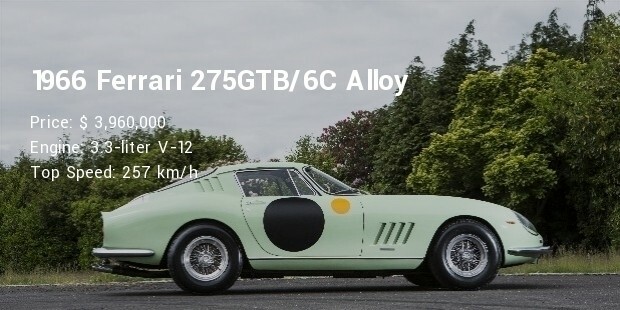 Mauro Forghieri designed a special super-lightweight steel and aluminium version of the 275 GTB chassis. A regular suspension was fitted, but it was made slightly stiffer by the addition of extra springs. 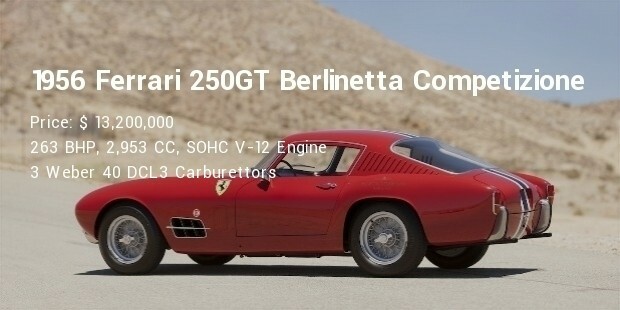 Scaglietti bodied the chassis with an ultra thin aluminum body; the panels were about half as thick as the ones used on the GTO and the Cobra - even leaning on the 275 GTB/C would dent the body; the entire rear section was reinforced by fiberglass to prevent it from flexing at the slightest impact. In all, this focus on saving weight made a difference of over 150 kg (331 lb) compared to the alloy bodied road cars. This rare Packard body style resulted in “arguably the most attractive closed automobiles of the prewar era” and that this is “arguably the most beautiful classic-era Packard.” If you still had money during the Depression, you flaunted it, and this now-restored, Dietrich-bodied sedan remains among the classiest ways to show off your wealth in the 21st century. The car is powered by a side-valve, 445.47 cubic-inch, V12 engine, producing 160 horsepower, coupled to a three-speed synchro-mesh manual transmission. It was capable of about 90 mph. It rides smoothly on a 147-inch wheelbase. 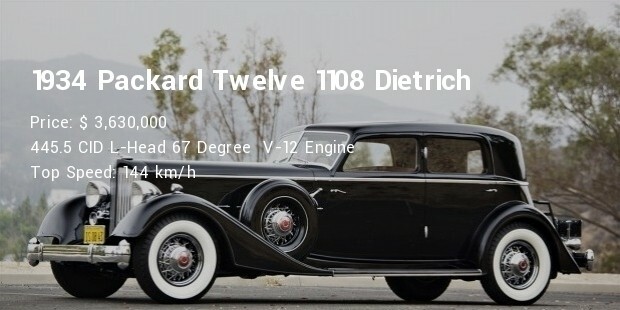 It is considered by many to be one of the finest automobiles produced by Packard and one of the most significant creations of the Classic Era. Not red in the least—and all the more beautiful for it—this matching-numbers restoration has a 3.3-liter V-12 that we’d never tire of hearing sing. 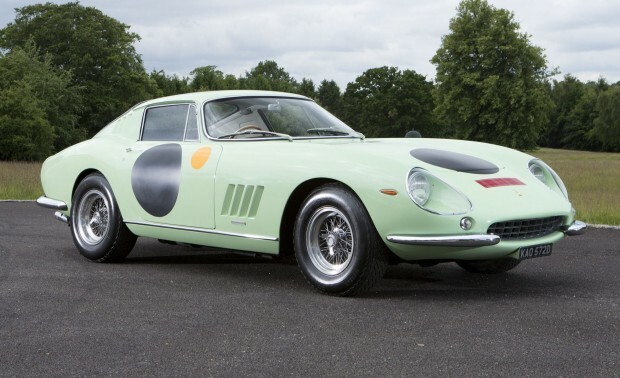 Only ten of these North American Racing Team cars was ever built; the Spider appeared in 1968's The Thomas Crown Affair with that movie's star, Steve McQueen numbered amongst the first NART owners (he crashed his); this specific car has had only one owner from new. 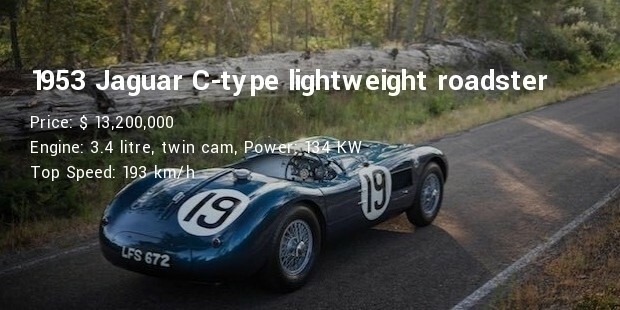 300 bhp 3,286 cc four overhead-camshaft V-12 engine, five-speed manual transmission, four-wheel upper and lower wishbone independent suspension, four-wheel disc brakes, and tubular steel frame. 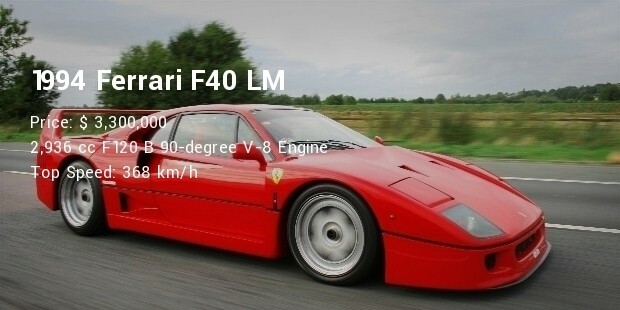 The F40 was fast, but the lighter was even more-powerful . The LM edition was more special. 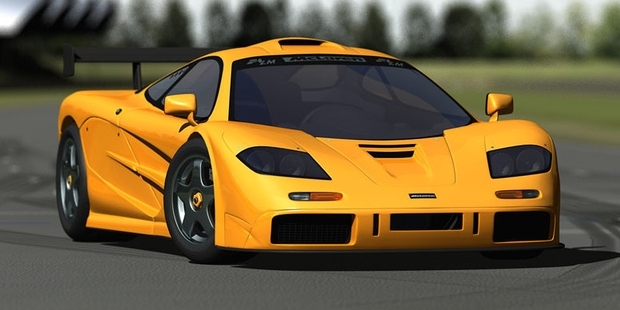 This car, one of the only 19 produced, has a 720-hp 2.9-liter twin-turbo V-8. 720 bhp, 2,936 cc F120 B 90-degree V-8 engine with twin IHI turbochargers and Behr intercoolers, Weber-Marelli electronic fuel injection, five-speed manual transmission, front and rear independent pushrod suspension with rocker arms, and four-wheel disc brakes. Two hundred miles per hour was a mythical speed in the 1980s. This limited-production Ferrari, dubbed the F40 LM, for Le Mans, would be much more radical, exclusive, and exciting than the already intense F40 in every way. Michelotto took the opportunity to completely revamp the car by reinforcing the chassis and fitting more aggressive bodywork with more extreme front and rear wings, as well as uprated brakes and suspension, a competition-spec gearbox, wider wheels and tires, and an even more stripped-out interior, which featured a futuristic digital dashboard. In a further effort to save weight, the F40’s distinctive flip-up headlights were replaced with fixed lamps behind Lexan covers. 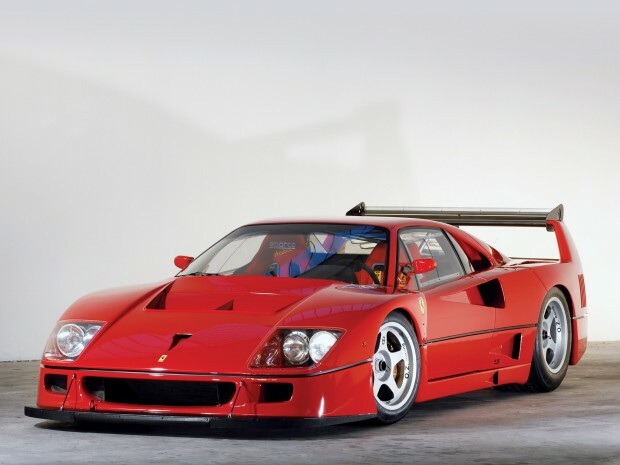 In the end, the F40 LM weighed in at just 2,314 pounds. 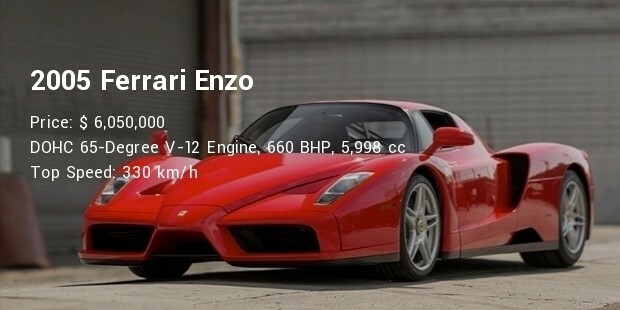 This big-engined Ferrari has a 5.0-liter V-12 that was said to be good for a top speed of 170 mph. Naturally, the original owner was Prince Sadruddin Aga Khan, “a gentleman of incomparable wealth, taste, and influence,” . Production proceeded at the leisurely rate of just one per month, allowing each Superfast to be personalised to individual customer order. 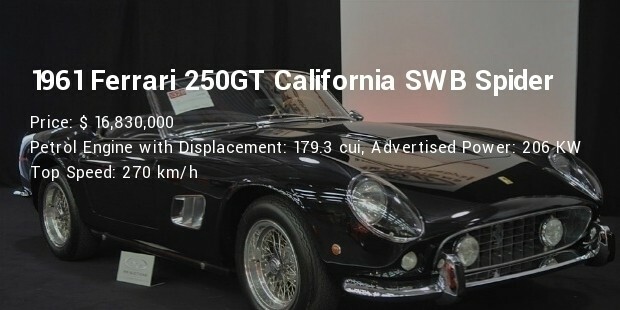 Most expensive cars sold in auto auctions through the traditional bidding process, consisting of those that attracted headline grabbing publicity, mainly for the high price their new owners have paid. Common contributing factors affecting the value of auctioned automobiles include Rarity, Low production volumes, Desirability, Original ownership , Authentic and aesthetic Design.